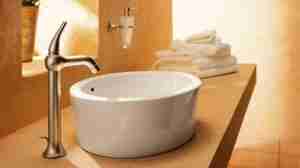 Whether your bathroom is large or small the new bathroom can be as invigorating and splendid as your imagination. Contemporary bathrooms utilise mirrors and space in ways never before experienced, positioning a bathroom’s features in ways you would not usually comprehend. They also maximise the use of new materials, wet room designs with walk in shower areas, toilets that appear from a wall and sometimes set away from a wall to provide shelving and other amenities behind. The bath too could be centralised, built on a podium, set before a landscape window – neighbours permitting. Contact us via our brief enquiry form right now and we will call you back at your earliest convenience. Find out how you can best take advantage of the newest bathroom materials and best water and heat efficient bathroom accessories. Contemporary suggests new and state of the art, though it doesn’t essentially mean expense. That would come under the category of luxury bathrooms where there is no ceiling to a household budget. Our designers are very modern thinking, so modern they are futuristic in design elements. We would not be the first to suggest you take over the loft of a block of flats and build over an elevator shaft with a very thick transparent glass floor. So how exactly does one arrive at a concept for a contemporary bathroom these days? Well, firstly by disregarding any notions of a traditional bathroom. That’s old styled piping and visibility, classical bath feet, metal or normal bath shapes.